Management and staff are dedicated to six basic values of construction. These are the keys to good customer service in our industry and a priority for all employees. Safety is a first and foremost value in construction. All employees are trained in safe construction practices and expected to be leaders in its day to day use on the job site. Backed by a 24/7 service fleet, customers can be assured that Bridge Electric will be available to provide service now and in the future. Bridge Electric wants every project completed to be a source of pride for the whole company. This starts with quality components and highly trained electricians and finishes with the professional installations left on site. We believe in functional room layouts designed with future expansion in mind, straight conduit runs, neatly dressed panels, aligned lighting, and most importantly, making it as invisible as possible. Bridge Electric believes in building long term relationships with their customers. In an open market place this can only happen if costs are kept competitive. This means that no matter the situation Bridge will price the work based on competitive market rates resulting in a price that can assure customer satisfaction while still providing a reasonable profit for the operations of Bridge Electric. Bridge Electric recognizes that once construction starts the next major owner milestone is occupancy. A building in construction doesn’t provide any value and value is what we strive to deliver in all aspects of our operation. As a following trade on site, it can be a challenge pushing the schedule. Our “On Time, Every Time” goal means we refuse to accept this as a barrier to success. This goal is difficult and Bridge Electric commits extraordinary efforts to it. Every employee of Bridge Electric is aware of the importance of this mission. They are trained to plan and co-ordinate their work and have the authority to take any reasonable action necessary to deliver “On Time”. We believe people are the core of our company and the reason for our success. We strive to create a strong culture of teamwork and family beliefs. We want everyone who has a goal to be given the opportunity and resources to reach their goal. This also means that everyone moving into a leadership position is fully trained through our in house or external training programs. Bridge Electric’s future depends on repeat business; consequently, we approach each job with the intention that it is the beginning of a long relationship with a new customer. 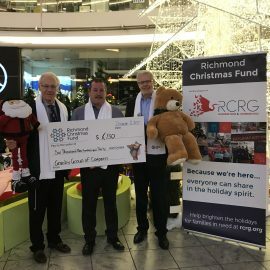 Bridge would like to thank all those who donated this year to the Richmond Hamper Fund at our annual Christmas party. The total donation of $5,470 was well received and will help many families this Christmas season.